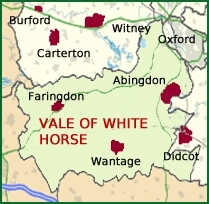 The Vale of White Horse lies between the River Thames in the north and the ancient Ridgeway road on top of the Berkshire Downs in the south, and stretches from Oxford south-west to the Wiltshire border. Its name comes from the well-known figure of a horse carved into the hillside above the village of Uffington. This is the oldest chalk figure in Britain and dates back to around 1000 BC. Most of the Vale of White Horse is very flat. However along the southern border are the Berkshire Downs which are part of the North Wessex Downs Area of Natural Beauty. The spring line at the foot of the hills is where the towns and villages nearest to the Downs have developed. North of the spring line the flat plain of the Vale stretches towards the River Thames, broken only by a low limestone escarpment known as the Midvale Ridge. After the Thames, the Vale's second river is the diminutive River Ock, which rises near Little Coxwell and flows into the River Thames at Abingdon collecting tributaries from springs along the base of the Downs. The main town of the Vale of White Horse is the attractive Thames-side town of Abingdon. Other Vale towns are the historic market towns of Faringdon in the west and Wantage in the south.